Artificial intelligence is back in the financial news. It seems like a good fit; computers can endlessly crunch the numbers and artificial intelligence software can learn how to sift for deals. Buy low, sell high - how hard could it be? One upstart in the AI race on Wall Street is Rebellion Research, a tiny New York hedge fund with about $7 million in capital that has been using a machine-learning program it developed to invest in stocks. Run by a small team of twentysomething math and computer whizzes, Rebellion has a solid track record, topping the Standard & Poor's 500-stock index by an average of 10% a year, after fees, since its 2007 launch through June, according to people familiar with the fund. Like many hedge funds, its goal is to beat the broader market year after year. "It's pretty clear that human beings aren't improving," said Spencer Greenberg, 27 years old and the brains behind Rebellion's AI system. "But computers and algorithms are only getting faster and more robust." One slow afternoon I asked a pair of chirpsithra about intelligent computers. "Oh yes, we built them," one said. "Long ago." One of the salmon-colored aliens made a chittering sound. The other said, "Reason enough. Machines should be proper servants. They should not talk back. Especially they should not presume to instruct their masters. Still, we did not throw away the knowledge we gained from the machines." 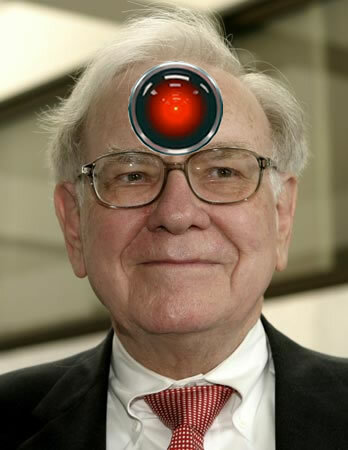 See also my earlier article on combining human insight with computer analysis to make money on Wall Street.